​This art is Trash. Really. You may have seen Kauai artist Tim Saunders on the side of the road or lurking around a condemned house. Don’t be afraid; he’s just looking for what most people would call garbage. 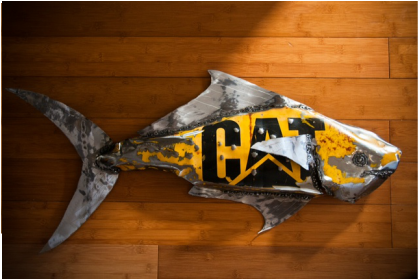 The self-declared pack rat uses discarded items such as old bed frames, car parts and barbecue grills to make his ocean inspired fish and wave scapes. A lifelong surfer and fisherman, Tim can usually be found on the sunny beaches of Kauai’s west side, or trolling for Ahi just offshore.